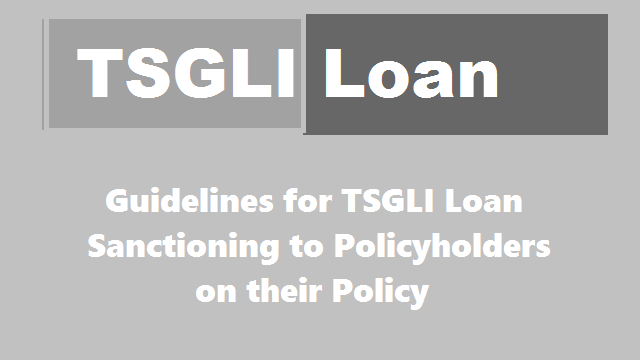 Guidelines for collecting of interest on TSGLI loans sanctioned & fixing the EMI with interest before sanction of loan - TS GO.34 Guidelines for TSGLI Loan Sanctioning to Policyholders on their Policy: G.O.MS.No. 34; Dated: 09- 04-2015:: Government of Telangana State, Finance Department, Telangana State Government Life Insurance Scheme - Sanction of Loan to Policyholders on their policies - Collection of expected interest of Loan - Orders - Issued. In the reference 2nd read above, Government have instructed and permitted the Director of Insurance to collect the interest on loan sanctioned to the policyholder soon after the loan in question is liquidated. Based on these orders of the Director of Insurance had revised the loan deduction order in which the Drawing and Disbursing officers are being asked to calculate interest on the loan soon after liquidation of loan at the rate given and recover the same from the loaness. 2. In the reference 3rd read above, the Director of Insurance has stated that as per their records and data it is found that most of the Drawing and Disbursing officers are recovering the principal amount only and no interest is being calculated and recovered from the pay of loaness. As a result the interest due from the policy holders is being recovered from the refundable amount at the lime of their claims or it is being adjusted in the subsequent loans. This is causing strain to the Life Insurance Fund and the Accountant Generals Audit party also has raised an objection to this system. Hence, to avoid audit objections in future and to save the fund from such strain, the Director of Insurance, has requested to accord permission to calculate the expected amount of interest due at the time of sanction of loan itself and inform the same to the concerned Drawing and Disbursing Officers duly requesting him to recover the same along with principal. The E.M.I will be consisting of both the principal and interest, any difference if arises it can be adjusted in subsequent loan or at the time of settlement of claim. 3. Government after careful examination of the proposal of the Director of Insurance, Telangana State, Hyderabad hereby accord permission to calculate the expected amount of simple interest on diminishing balance method at the time of sanction of loan itself, fix the E.M.I., and inform the same to the concerned Drawing and Disbursing Officers duly requesting them to recover the same which will be consisting of principal and interest. The Director of Insurance shall see that any excess or less amount of interest so recovered is accounted and adjusted at the time of subsequent loan or settlement of claim. 4. The Director of Insurance, Telangana State, Hyderabad shall take necessary action in the matter accordingly.